The development of oil and gas fields offshore requires specialized pipeline equipment. The structures must be strong enough to with stand the harshest environments, and ensure that production is not interrupted and remains economically feasible. However, recent events in the Gulf of Mexico have placed a new importance on maintenance and reliability. A new section; Condition Based Maintenance (CBM), introduces the subject of maintenance, written by Tian Ran Lin, Queensland University of Technology, and Yong Sun, CSIRO Earth Science and Resource Engineering. Two of the main objectives of CBM is maximizing reliability while preventing major or minor equipment malfunction and minimizing maintenance costs. In this new section, the authors deal with the multi-objective condition based maintenance optimization problem. CBM provides two major advantages: (1) an efficient approach for weighting maintenance objectives, and (2) a method for specifying physical methods for achieving those objectives. Maintenance cost and reliability objectives are calculated based on proportional hazards model and a control limit CBM replacement policy. 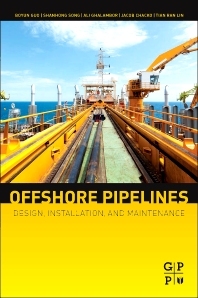 Written primarily for engineers and management personnel working on offshore and deepwater oil and gas pipelines, this book covers the fundamentals needed to design, Install, and commission pipeline projects. This new section along with a thorough update of the existing chapters represents a 30% increase in information over the previous edition. Oil and Gas Engineer at Innovative Petrotech Solutions, Inc.